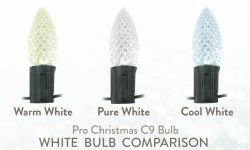 Warm white is the most popular color of LED Christmas lights. It has a slight yellow hue giving it a warmer look that is closer to what most people are familiar with when using traditional incandescent Christmas lights. Warm White LEDs tend to be the most problematic color when it comes to color consistency. The amount of yellow in the LED varies greatly from one manufacturer to another. So far the factories in China that produce the vast majority of Christmas lights have either been unwilling or unable to establish a consistent standard of what warm white should be. The issue of color inconsistency is a problem for everyone that sells Christmas lights; from the giant big box retailers like WalMart all the way down to the small web based Christmas sellers. If you need to match a specific color of warm white, it's best to ask for a sample first. Product images can be misleading and it's impossible to know if the image you are looking at correctly reflects the true light set color. Hopefully as LED Christmas lights continue to become more and more popular, standards will eventually be set for color consistency. Pure White LEDs are exactly what the name states, they are purely white, with no other colors visible. Some people love the pure, crisp look of the pure white, but others feel that it's too harsh and not as soft as the warm white. It all comes down to personal preference. Recently we have seen a significant increase in the number of pure white lights that are selling and we're anticipating this variation of white will become more popular as people begin to embrace a truly white LED light. One significant advantage of pure white LED Christmas lights is that the color consistency is much better. The pure white from one manufacturer to the next is usually very close and it's much easier to match up colors year after year. Cool white LEDs are often misrepresented as pure white. Many well established Christmas businesses confuse cool white and pure white. LEDs that are truly cool white have a slight blue hue to them. 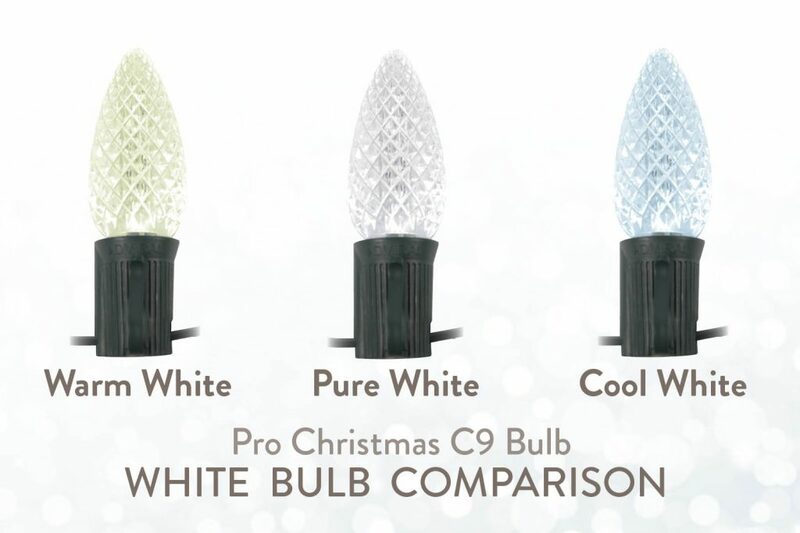 The first white LED Christmas lights that were developed fell into the cool white category. During the first few years of development, it was simply too costly to create true white or warm white LED Christmas lights, as a result there was always a blue tint to the lights. There are some color consistency issues with cool white, although they are not as serious as with warm white. Manufacturers such as Minleon, who are known for making high quality LED retro fit bulbs only have a very slight blue tint. Their cool white is very close to a pure white. But other manufacturers, especially those that specialize in low cost, big box retail LEDs tend to have much heavier blue tones in their bulbs. As is the case with warm white, if you are trying to match a particular color, it's probably best to ask for a sample first. In addition to the three colors of white mentioned above, you may encountered other names for white LEDs. These can include antique white, soft white, off white, and classic white. Generally these all fall into a variation of warm white. Even though LED Christmas lights offer substantial benefits, it is no doubt frustrating trying to deal with the color inconsistency with white LEDs. Your best option is to find a good, solid Christmas seller and stick to the same one year after year. Here at Christmas Designers we work very hard to maintain the same look of our white lights each year. Hopefully in the near future our Chinese counterparts that supply the world with Christmas lights will all get together and come up with the exact color temperature for each of the three variations of white. While that might seem like a small step for the average person, it would be a giant leap for all of us who make our living within the Christmas industry.